Today I was able to read my very first British-ringed Oystercatcher (metal ring), in Nieuwpoort. Few Herring gulls were around (only 1 colour ring and 2 metal ones, all known Belgian birds), but I was very happy to read a French Lesser black-backed gull, and 2 Greater black-backeds (Norwegian and Danish). These were all too distant to take decent pictures, so I only have one of the Oystercatcher. Oystercatcher London FA50784 (the female). The male bird was a Belgian one, but unfortunately I was not able to read the code. This week, I saw my first wing-tagged Marsh harrier of the year. The past 2 years, more than 200 juveniles have been wing-tagged in Belgium and the south of the Netherlands, and several birds were seen the past few weeks. I checked every harrier I saw, and finally, last Tuesday I could read the code of a female bird. It was tagged last summer close to where I saw it. Since most sightings of tagged birds are from birds ringed in 2011, seeing a 2nd cal year was very nice. I hope to see many more of these birds in the following weeks! Afterwards, I was able to read 7 ringed Herring gulls, of which 2 were Dutch: 1 from R.J. Buijs (a known bird to me), and 1 metal-ringed bird. Also 1 of the regular metal-ringed Jackdaws was present. 2nd cal female Marsh harrier (A. Anselin), tagged last year and now back in Belgium! Herring gull Arnhem 6.426.549. It should be heading to it's breeding colony soon. Herring gull yellow XB (R.J. Buijs), the last time I saw this one was in August last year, so good to see it's still alive and doing well. Herring gull blue YX.AB (E. Stienen), a new one! Jackdaw Brussel E337306, a regular bid in Nieuwpoort. Guernsey Herring Gull in Belgium! Today I checked the resting gulls in Nieuwpoort again, and immediately saw an immature Herring gull wearing a white ring. Luckily it stayed where it was, and I was able to read the code, and take some pictures as well. I recognized the code as probably belonging to Paul Veron's ringing scheme, and this was confirmed by him later this evening. 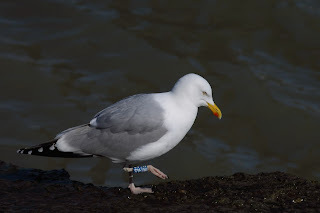 It even turned out to be the first of his colour-ringed Herring gulls seen in Belgium! He ringed this bird in December in his garden, so it's not known where this bird originates from, let's hope it will be seen many times more. Other rings were all Belgian ones, with 3 known birds seen. I also managed to read the code of one Ruddy turnstone, probably locally ringed. 2nd cal Herring gull white 0HA4 (P. Veron), my first Guernsey-ringed bird! ad Herring gull blue MT.AS (E. Stienen). 4th cal Herring gull blue PFA.F (E. Stienen). Gulls, Jackdaws and White storks! A short stop at the coast yesterday resulted in the reading of 5 gull-rings (all Belgians), and 3 locally-ringed Jackdaws. When I got home, I got news about 5 White storks not so far away. When I arrived there, I was pleased to see that 3 of them were ringed. I managed to read 2 of them, both were Dutch birds. Herring gull Brussels H145683, also seen there the day before. Herring gull blue YSA.C (E. Stienen), my first sighting. White stork NLA 1E679, ringed in 2011 as a juvenile on the nest in the Netherlands. White stork Arnhem 7529, ringed in 2006 as a juvenile on the nest in the Netherlands. 5 White storks resting during their migration. Herring gull blue MT.AS (E. Stienen), my previous observation of this bird dates from August 2010. Herring gull blue SBA.R (E. Stienen), my first sighting, and the first time since 2011 that this bird is observed. Lapwing Brussel 6T14014, my first-ever Lapwing ring-reading! Last weekend, I visited my old ring-reading patches in Gent, and I was very happy to see some birds that I have seen many times before. LBBG's were omnipresent, and in the end I was able to read 11 rings, a nice total! All of them were Dutch-ringed birds, apart from 1 with a French ring, a bird I had also seen there in June 2011. LBBG yellow 6F (RJ Buijs), my first sighting. LBBG red 254N (P. Dubois), only 2 observations of this bird exict, both by me in Gent. Who finds this bird in winter in Spain, or in summer breeding in the Netherlands? LBBG white D.7 (RJ Buijs), I saw this bird before in Boulogne-sur-Mer in 2009. LBBG blue HF (RJ Buijs), one of the rings I read many times before. LBBG white M.8 (RJ Buijs), again a known bird to me. LBBG red MT( RJ Buijs), alsoa familiar bird. LBBG white N.J (RJ Buijs), a new bird to me. LBBG red X1 (RJ Buijs), also a new one. LBBG red YB (RJ Buijs), the last new one.